[toc]Rhabdomyolysis is a serious condition in which the breakdown of muscle fibers results in the releasing of myoglobin, which are muscle fiber contents, into the bloodstream. This can cause a great deal of damage to the kidneys and lead to many complications such as kidney failure. In addition, fluid retention at the site of injury can reduce the body’s fluid supply which reduces blood flow to the kidneys. This causes further kidney damage. Some of the symptoms that are observed are muscle weakness, muscle aches, and dark colored urine. Prompt treatment can often save the patient from any harm and can provide complete recovery after hospitalization. But, in advanced cases, rhabdomyolysis may be very fatal and can cause death due to kidney failure and other complications. Most often, rhabdomyolysis is seen in people with severe injuries or those who have suffered coma. It is a rare condition that can develop due to many causes. Some of the most prominent causes are mentioned here. Extreme muscle strain can cause rhabdomyolysis, and it is more so in the case of untrained athletes who do not know about proper techniques and ways to recover from exhaustion. However, even well trained athletes can suffer from rhabdomyolysis due to overexertion as the body gets dehydrated severely. This condition can easily be treated if immediate medical attention is given to the patient. There are certain medications that may cause rhabdomyolysis in certain people. An example is cholesterol lowering medications that increase the risk of a person getting rhabdomyolysis. 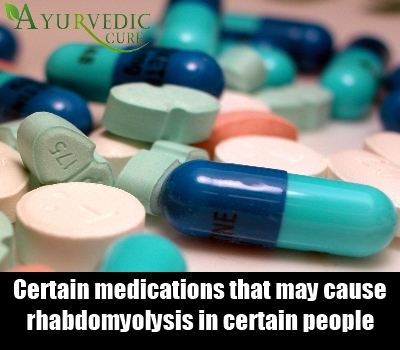 There are many other prescription drugs that can cause rhabdomyolysis as a side effect. Antidepressant medications can cause serotonin syndrome and this may lead to development of rhabdomyolysis. Certain anesthetics could also cause this condition. Illegal drugs like cocaine, amphetamines, LSD, steroids, etc. can also cause severe muscle trauma, resulting in rhabdomyolysis. Direct muscle trauma can also cause rhabdomyolysis. A patient may lie unmoving in a certain condition for a long time, which could also cause rhabdomyolysis. The patient may suffer from direct pressure injury after an accident, which could result in the development of this condition. Crush injuries to the muscles after a fall or accident can also cause rhabdomyolysis. That is why it is most essential to seek immediate medical attention for those who have had a crush injury or have suffered from trauma. 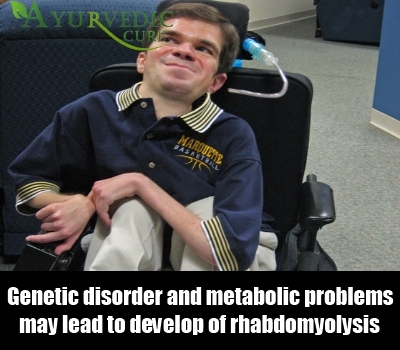 Genetics also play an important role in the development of rhabdomyolysis. Genetic disorders like Carnitine deficiency, McArdle’s disease, Lactate dehydrogenase deficiency and Duchenne’s muscular dystrophy, etc. 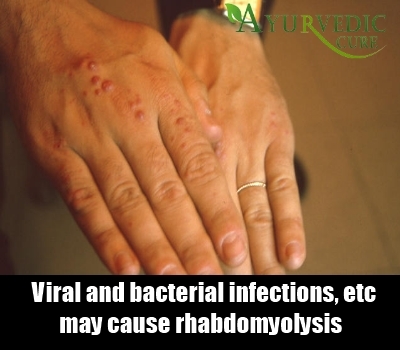 can also cause rhabdomyolysis. Metabolic problems can also trigger rhabdomyolysis. Some of these are hypothyroidism and diabetic ketoacidosis. People who have problems with lipid and carbohydrate metabolism can also develop rhabdomyolysis.